Santiago Salazar aka DJ S2 is a second wave artist emerging out of Los Angeles in the 1990′s then moving to Detroit to join the highly respected Underground Resistance. After releasing material under the UR label, Santiago began to tour around the world headlining sold out venues in Europe & Japan such as Liquid Room(Tokyo), Berghain(Berlin), Rex Club(Paris) and Fabric(London). In addition, Santiago also played large festivals such as DEMF(Detroit) and Metamorphos(Japan). 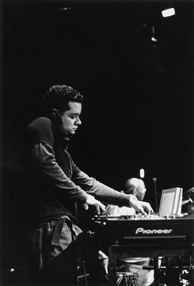 By 2006 Santiago relocated back to L.A. leaving UR & launching I can Productions with partner Esteban Adame which releases have been charted by Jeff Mills and Laurent Garnier to name a few. Santiago has solo releases on Rush Hour, Historia y Violencia and Berlin’s Macro Recordings. In 2013 Santiago started his new label Major People.